The Rebel Sweetheart. : Foodie Goodie | Adobo with Lemon Zest and Peanut Butter. Foodie Goodie | Adobo with Lemon Zest and Peanut Butter. Posted this photo on my Instagram last weekend, and since then I've been receiving requests for the recipe. Now for my foreign friends who may not be familiar with the name 'adobo', it's a popular Filipino dish cooked in soy sauce, vinegar, and garlic. There are many different ways to cook adobo. Some use pork, others prefer to use chicken, or a combination of both. And then there are some who like their adobo with chicken gizzard and liver. (I don't, though. Haha!) There's a version of adobo that uses annatto, there's one that uses yellow ginger, and yet another that uses coconut milk. Adobo with Lemon Zest and Peanut Butter. 1. Marinate chicken in soy sauce, lemon juice, bay leaves, and garlic for thirty minutes. Drain the meat, and set the marinade aside. 2. Add the oil in a large frying pan. Saute the chicken until the sides turn brown. 3. Add the marinade, lemon zest and peppercorns. 4. Simmer for about 15 minutes. Add water if necessary. 5. Add the peanut butter, mix it well. Simmer for another five minutes. 6. Remove from heat, and serve with rice. Zest the lemon using a grater. That looks really yummy. i would love to try that. i dropped by just in time! I'm planning pork adobo for supper and will sure try this. My peanut butter's been sitting there for a good month waiting to be used ay! OMG! This looks so freaking tasty! I'm going have to bookmark this for later use! Thank YOu! Oh wow, That looks tasty! I'll have to give this a try. I saw your Fb picture and I was drooling! I had to come over and see how you made this. Yum!! That looks so delicious! Can you come over and cook for me! 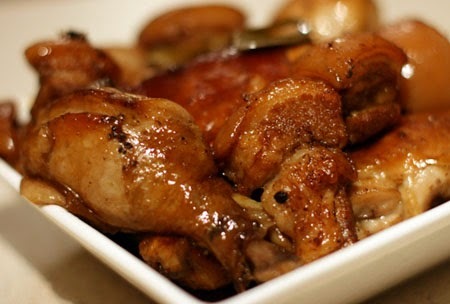 This is another must try variand of Adobo! LOVE that shot ... nakakagutom! was wondering (dun sa IG) how you made your particular adobo, sis. now i know! will do this ... soon! bookmarked!